Crema catalana is a typical dessert of Catalonia (The Spanish autonomous community of Catalonia borders on Valencia to the south, Aragon to the west, France and Andorra to the north, and the Mediterranean Sea to the east and southeast), consisting of a custard base and a caramelized, crisp sugar topping. It is usually served on Saint Joseph's Day, March 19. 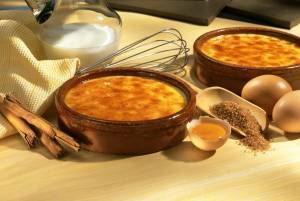 Crema catalana is sometimes claimed to be the predecessor of France's crème brûlée, though many regions lay claim to the origin of the dessert. The main difference between the two are: crema catalana has fine cornflour; crème brûlée doesn't. And crema catalana is not baked in bain-marie, as crème brûlée is. On the other hand, crème brûlée is made with heavy cream, and crema catalana with milk. Crema catalana is made with egg yolks, sugar, lemon, cinnamon, milk and cornstarch, forming a custardlike base. Just before serving, sugar is sprinkled over the top and caramelized with a specially-made iron-like heater or a culinary torch, creating a hot, crunchy contrast to the cool pudding underneath. Traditionally, on St. Joseph's Day, the privilege of making crema catalana is granted to grandmothers and maiden aunts. Crema catalana is traditionally cooked on the stovetop and thickened with cornstarch. This delicate version of this custard is baked in cazuelas or ramekins set in a water bath. Or you can use a shallow 10.5-oz. baking or gratin dish. Preheat an oven to 300 degrees F/150 degrees C. Have a pot of boiling water ready. Line a shallow baking pan with a kitchen towel. In a saucepan over medium-low heat, warm the cream, cinnamon stick, lemon zest and the 1/3 cup sugar, stirring often, until the sugar dissolves, 4 to 5 minutes. Set aside to steep and cool slightly, 10 to 15 minutes. In a bowl, whisk together the egg yolks and vanilla until blended. Strain the cream mixture through a fine-mesh sieve set over a clean bowl, then whisk into the yolk mixture. Divide the custard among four 10-oz. cazuelas or ramekins. Set them in the baking pan and add boiling water to fill the pan halfway up the sides of the cazuelas. Cover the pan loosely with aluminum foil and bake until the custards are just set, 30 to 35 minutes. Transfer the cazuelas to a wire rack and let cool to room temperature, then cover and refrigerate until well chilled, 3 to 4 hours. Just before serving, sprinkle 2 tsp. sugar evenly over each custard. Using a culinary torch, melt the sugar according to the manufacturer's instructions until golden. Serve immediately.